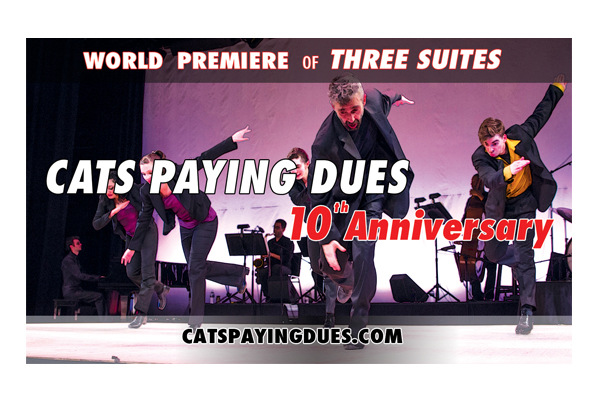 Cats Paying Dues and founding artistic director, Andrew Nemr, will celebrate their 10th Anniversary Season with the premiere of Three Suites in May 13-17, 2015. The new work will highlight the unique aesthetics the company has brought to the stage over it’s ten year history. A path for the future will also be charted with a special collaboration with hammered dulcimer virtuoso and composer Max ZT and his band House of Waters. Core company members Allie Pizzo, Carlos Morales, Jason Stump and Mallory Davis will be joined by past alum Alexander MacDonald, Jess Gersony, and Thomas Sutter, and affiliates Adele Joel and Naoyuki Hashimoto, as the company continues it’s model of being a place of mentorship and community for dancers and unique application of the craft. Max ZT, House of Waters, and artistic director, Andrew Nemr, will also perform. Schedule: May 13, 14, 15, 16, 8PM – May 16 and 17 2pm.